Home / About Abby's House / Who is Abby? Abby’s House is named in honor of Abby Kelley Foster, an abolitionist and advocate for women’s rights. Born in 1811 in Pelham, Massachusetts, Abby Kelley Foster moved to Worcester with her family that same year. Reared in the Quaker faith, Abby developed a spirit of independence and commitment early on in life, both of which led her to embrace a long and difficult career as an agitator and lecturer. For many years, Abby traveled around the country, promoting freedom for slaves and women’s rights. She opened public platforms to women, and by her very presence, awakened many young women to a consciousness of their own power. Her views were not always welcomed by the people in the towns she visited, and Abby sometimes found herself without a place to sleep for the night. 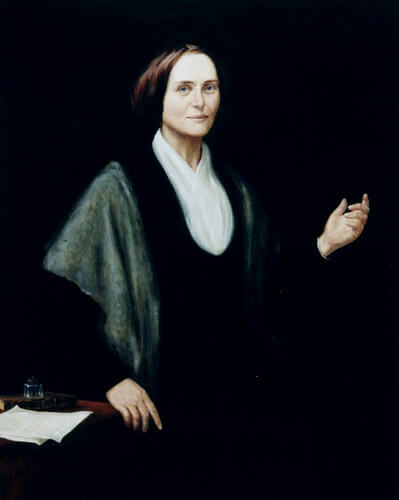 During her remarkable life, Abby Kelley Foster helped develop plans for the first National Woman’s Rights Convention held in Worcester, MA, in October of 1850, was an organizer of the founding convention of the New England Woman Suffrage Association, and under the auspices of the American Anti-Slavery Society, undertook the effort of organizing and financing passage of the 15th Amendment. On her farm in Worcester, where she lived with her husband, Stephen Foster, and daughter, Alla, Abby and her family sheltered runaway slaves, with the farm serving as a stop along the Underground Railroad. In the years leading up to her death in 1887, Abby refused to pay property taxes because, as a woman, she was not allowed to vote. In her speech at the National Woman’s Rights Convention, Abby remarked, “Bloody feet, Sisters, have worn smooth the path by which you come hither.” Abby was one of those women who paved the way for us all. Check out the Worcester Historical Museum and the American Antiquarian Society’s collection of Abby Kelley Foster’s papers.